Rumor (or rap lyrics) has it that Pusha T had a very close relationship with a certain Madonna look-alike on the balcony of the Delano…that is, before LeBron had her and probably after a few rounds at the decadent Rose Bar. 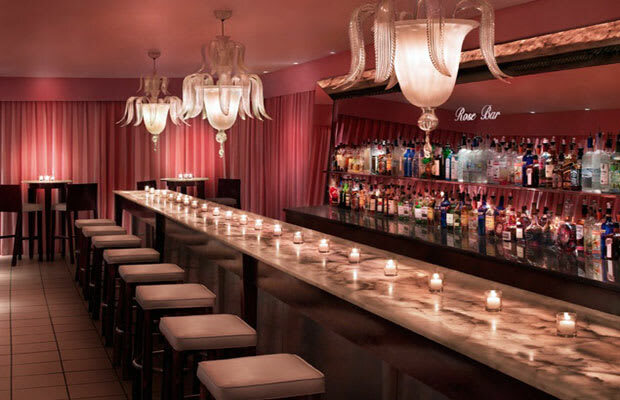 Red drapes line the walls, Venetian glass chandeliers dangle above the bar seating, and celebs and gold diggers alike scatter the blush-hued interiors. You didn’t come here to eat, so don’t expect much from the dining menu, but the cocktail variety is expansive, so you can indulge accordingly.